This past weekend I dragged home another new friend from the Farmers Market. There, at Macready’s, in a corner all cozied up next to the eggplant lurked a suspicious extraterrestrial specimen – an odd sort, sporting a bumpy, chartreuse green, purple tinged cone head. “What’s this? !” I squint and puzzle. As if it was just another eggplant. No newcomer I learn, broccoli Romanesco has been around since 16th century Italy. These days it is regarded as a specialty crop and rarely appears in the average grocery store – thus, the perfect candidate for farmers markets. Apparently, it has grown in popularity with urban gardeners as well, due to its unusual appearance plus the fact that it can regenerate itself. The gardener need only harvest a required amount, not the entire head, and it will grow back again. Much later the same day, in hungry deliberation, my refrigerator looks very empty and not much to draw from. Except for a peculiar chartreuse addition. I inspect it and decide it looks neither like cauliflower nor broccoli, besides anything resembling those familiar florets is replaced by quirky spirals. I quickly assess the obvious possibilities. When I think of cauliflower I tend to first consider a curry or a cheesy sauce. Here, curry may mask its flavor and I will never know what I’ve eaten. 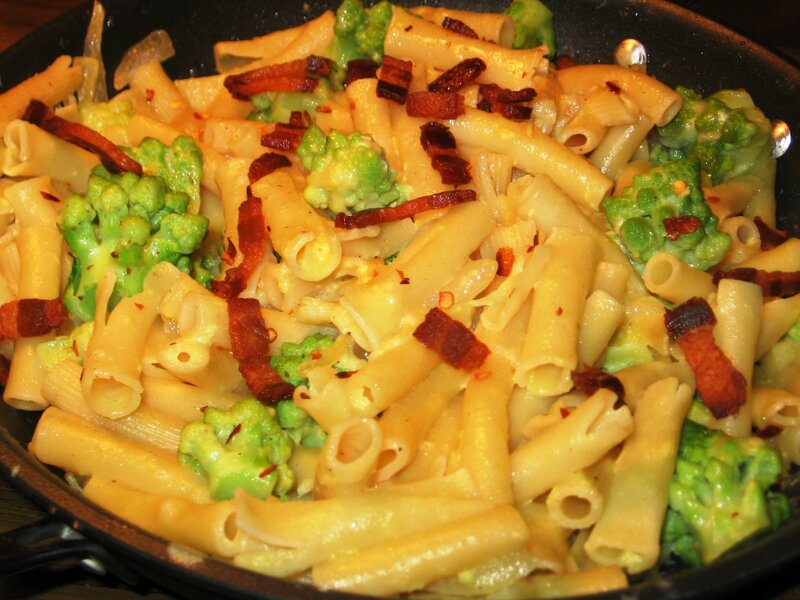 Moving towards cheesy, I opt to honor its Italian heritage and go for a variation on an old standby, Pasta Carbonara. I have been preparing versions of Pasta Carbonara for years and it continues to adapt and re-invent itself, depending upon my current financial condition and/or health foc us. It is basic enough that I usually have the necessary ingredients on hand and can create a tasty and satisfying meal in no time. Here’s one more evolution that makes an easy one pot meal in less than an hour. In a large pot, bring salted water to a boil. Cut broccoli into bite sized florets and set aside. In a small bowl beat egg, Parmesan cheese, salt and pepper and set aside. In medium skillet cook bacon til crisp; remove bacon and drain off all but 2 Tbsp bacon drippings. Add onion, sauté onion til soft and translucent, add garlic and crumbled dried pepper flakes and toss til aromatic. Meanwhile cook pasta about 6 minutes, add broccoli and cook another 3 minutes, til all are still al dente. Do not over cook. Drain, reserving about 1 cup pasta water. Whisk about 1/2 cup water into to egg mixture. Notes after the fact: I’m impressed! 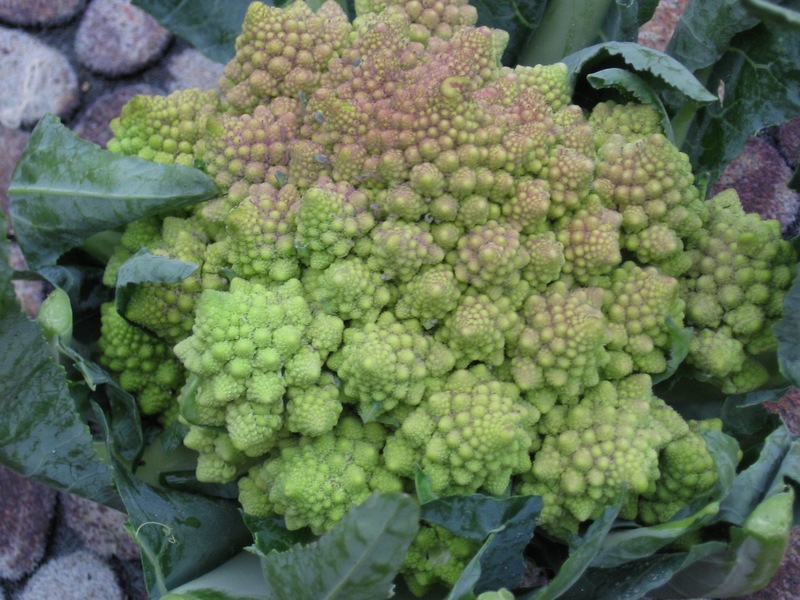 Broccoli Romanesco has a slightly sweet root flavor similar to turnips. It makes a perfect component with the pasta for a quick one dish meal, and it is good match with the creamy cheese and bacon of the Carbonara Sauce. Cooking it al dente, as I prefer most of my vegetables, holds the color and shape nicely. Next time I will bring home a bigger head!